I love thinking about numbers, and so there are few things more important to me than a proper appreciation of numbers and looking at them with an appropriate perspective. Scale can be hard to fathom. Especially when the numbers are very big or very small. For instance, when we talk about items in the federal budget, those numbers are just so eye-wateringly big that it’s hard to think about much else. Let alone get beyond the ‘million’ or ‘billion’ and remember that the federal budget itself is mind-boggingly huge. This idea was really driven home to me when I wrote about the funding for Obama’s BRAIN initiative—$200 million sounds big. Until you remember the total NIH budget is 150 times that. Yeah, putting things into the proper perspective can be tough. 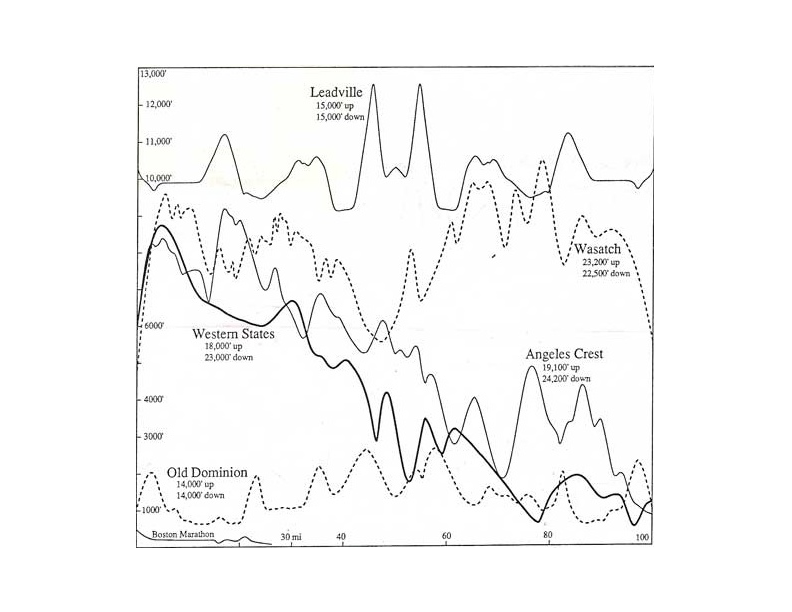 The elevation profile of the Boston marathon from the perspective of famous 100 mile races. The tiny, little bump at 21 miles? 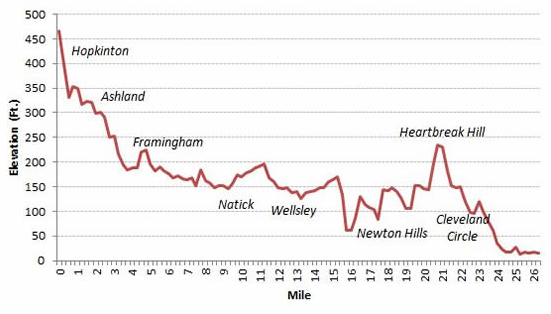 That would be the infamous Heartbreak Hill. When we put figures in relation to other numbers and we look at them with a sense of scale, big numbers, small numbers, percentages, facts become tractable,—in some cases, I’ll even go so far as to say ‘powerful’. 25 hedge fund managers earned $21.1 billion in 2013. Which is more than twice what every kindergarten teacher earned. A few weeks ago Rob Krar won the prestigious Western States 100 mile race in a total time of 14:53:22. That’s an average pace of 8:56 minutes per mile. Or, to put it a different way, he averaged a 3:54 marathon time for just about four marathons. In a row. The NIH budget in 2014 is $30 billion, approximately 0.8% of the total federal budget. The equivalent to ordering 3-4 tall Americanos every week from Starbucks on a $50,000 yearly salary. Last year, Chris Froome won Le Tour de France in 83:56:40. The second place rider (Quintana Rojas) finished 4 minutes and 20 seconds behind him. A pretty small difference. How small? Well, if your morning commute takes 30 minutes, second place would be a commute taking 30 minutes and 2 seconds. Africa is a large continent: it covers a total area of 11.67 million square miles. That’s the same size as nearly 3 (2.96, to be precise) Europes, 17.5 Alaskas or 7,505 Rhode Islands. As of January 1, 2014, sales for the entire Harry Potter franchise reached just over $24.7 billion. That’s enough money to put 162,902 students through all four years at a private college. There are an estimated 16 million children in the US living in poverty. That’s more than the total number of people in its three largest cities: New York, LA and Chicago. Obligatory point of reference: Paul Ryan ran his marathon in 4:01:25. As a professional scientist, whenever I hear debates about whether increase biomedical funding, it’s really hard for me not to think “penny wise, pound foolish”. I won’t admit to having gone through a phase where this scenario pretty much summarizes a “light” coffee week for me. But I won’t deny it either.